Interested in charting your cycle? 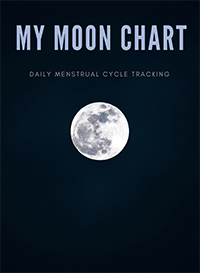 Get my free Menstrual Moon Chart. As women, we have an extraordinary window in to our overall health: our menstrual cycle. Each month, your body gives you feedback how well it is being taken care of. Tracking your cycle helps you identify patterns you may not otherwise recognise. Avoid pregnancy naturally or conceive a baby. These charts form the basis of the Fertility Awareness Method - a natural form of contraception that can also be used for conceiving. The lunar cycle lasts 29.5 days. Interestingly, the global average menstrual cycle last 29 days. Menstruating women share interesting parallels with the moon phases. Traditional cultures often compare the full moon with ovulation and new moon with the monthly bleed. In fact, the words “menstruation” and “menses” are derived from Latin and Greek words meaning moon (mene) and month (menses). Will you spam me if I download it? When you download one of my PDF resources, I’ll sign you up to my VIP newsletter, which provides nutrition tips and facts to hack your best life. You can unsubscribe at any time.